Now I praise you because you always remember me and keep the traditions just as I delivered them to you. 3 But I want you to know that Christ is the head of every man, and the man is the head of the woman, and God is the head of Christ. 4 Every man who prays or prophesies with something on his head dishonors his head. 5 But every woman who prays or prophesies with her head uncovered dishonors her head, since that is one and the same as having her head shaved. 6 So if a woman’s head is not covered, her hair should be cut off. But if it is disgraceful for a woman to have her hair cut off or her head shaved, she should be covered. 7 A man, in fact, should not cover his head, because he is God’s image and glory, but woman is man’s glory. 8 For man did not come from woman, but woman came from man. 9 And man was not created for woman, but woman for man.10 This is why a woman should have a symbol of authority on her head, because of the angels. 11 In the Lord, however, woman is not independent of man, and man is not independent of woman. 12 For just as woman came from man, so man comes through woman, and all things come from God. 13 Judge for yourselves: Is it proper for a woman to pray to God with her head uncovered? 14 Does not even nature itself teach you that if a man has long hair it is a disgrace to him, 15 but that if a woman has long hair, it is her glory?For her hair is given to her as a covering. 16 But if anyone wants to argue about this, we have no other custom, nor do the churches of God. Now, the very clear teaching is in v 6: she should be covered. It is largely uncontroversial that this is talking about corporate worship. Verse five specifies “prays or prophesies,” and it is here that the best argument against headcovering is founded: that women only need to have their heads covered while speaking aloud in church. That, however, makes the whole passage pointless because Paul also forbids women to speak in church. So… what can it mean? I think it is better to read it in the context of church life (as the entire passage is) and leave the question of whether women are prophesying out loud or not in church to a different discussion. My thought is that either this means quiet prayer / participatory prayer, or else maybe the early church was less formal and people were speaking to each other. But I think this has nothing to do with the headcovering question, rather the issue of “women prophesying” at all, and how that looked in corporate worship, and it’s better to separate the question and say, whatever was proper for women to do in church, they should be covered. This is a tradition. Verse 2. There is scant biblical evidence but firm Talmudic evidence that headcovering was the de facto Jewish tradition and law. This is what converted Jews would have done. At any rate, by the time Paul is explaining it, it’s a tradition of the Church. This is an example of headship. Verse 3-5. Christ is the head of man, man is the head of woman. It is dishonoring to man’s head to cover it (man’s head is Christ); it is dishonoring to woman’s head to not cover it (woman’s head is man). To be uncovered in church is the same as to shave your head. Verses 5-6. It is “disgraceful,” Paul says. More on this below. Because of Creation: men should not cover their heads because they are God’s image and glory, but woman is man’s glory. Verse 7. It shows the created order and purpose (woman was made for man). As a symbol of authority: verse 10: this is why headcoverings. It’s to show the authority of the man over the woman, and to show (in men) the authority that the man has. Because of the angels. Verse 10. Nobody knows what this means. That’s really the bottom line. Some people suggest that it’s talking about modesty, either because of the bad angels (cf. Genesis 6) or to not tempt the good angels (see Ecclesiastes 5:6). Another possibility is that the practice of covering is in imitation of the angels, Isaiah 6:1. Another possibility is based on a few verses (and a lot of tradition) that suggest the angels are present (witnessing) in corporate worship, and that consequently doing things properly is even more important… but really, nobody has a clue what this means. Because nature teaches it. Verses 13-15. Nature teaches that women need a covering beyond what men have. Because it is a tradition. Verse 16. This verse is often misinterpreted, but this seems to be the best understanding: don’t argue with everything I just said, because this is what everybody in the churches of God does. This is our custom. This is the essence of one of the most confusing aspects of the passage—the “hair” covering and the “wear a covering” covering. Throughout Paul appeals to the natural reality of women having long hair, and some get confused and say that the long hair is the covering he refers to. This does not, however, make sense. Fundamentally, it doesn’t make sense because the Greek word in 15—“her hair is given to her as a peribolaion”—is not the same Greek word used in verse 6—“she should be katakalupto.” They mean two different things. Paul could have used the same root for each but chose not to. This misunderstanding never could have arisen from reading the Greek, because the key point doesn’t match up. Paul commands that women be katakalupto but long hair is a periobolaion. But every woman who prays or prophesies with [shaved hair] dishonors her head, since that is one and the same as having her head shaved. So if a woman’s head is [shaved], her hair should be cut off. But if it is disgraceful for a woman to have her hair cut off or her head shaved, she should [have long hair]. I think what Paul is trying to say in this passage is that there are two coverings. There is one covering, long hair, which is recognized even by natural man, and which is God’s gracious gift to women everywhere as a natural sign of femininity (and in turn, submission). This teaches us even in our wretched state that women should be “covered” with long hair. In the church, however, when we are approaching the things of God—and woman is the glory of man, not of God (verse 7)—there is another covering required, because in worship of God, it is proper to veil the glory of man. When Paul says, then, “every woman who prays or prophesies with her head uncovered dishonors her head, since that is one and the same as having her head shaved” (verse 5), I think he means head uncovered in church is the same thing as having no hair outside of church. I.e., lacking the proper covering for the proper context (lacking a covering for church, lacking long hair outside church). There are a few different ways people intend this objection. The first, is that the Bible is not culturally inerrant, is used likewise to dismiss the passages about homosexuality, women speaking in the church, etc., so I’m not even going to bother with it. We can’t dismiss the passage simply as no longer relevant. Which brings us to the first legitimate question, which is, is the specific expression of the principle here merely cultural? I.e., why not just wear wedding rings? Well, I think the answer to this is in Paul’s if in verse 6: “if it is disgraceful… she should be covered.” And one might argue that it is no longer disgraceful for women to have short hair, but I think that argument is folly and degeneracy. It still makes news when celebrities shave their heads, or even get ultra-feminine pixie cuts. Chemo patients buy wigs, or wear scarves—if they’re women. Men don’t wear wigs and certainly don’t wear scarves to cover their baldness. I think Paul’s if is still answered with a “yes,” political correctness aside. Secondly, our culture doesn’t have a parallel expression to fall back on: wedding rings are only for currently-married women and… men. Paul is fundamentally talking about a symbol of gender here. I can see the argument that skirts might apply, but then we have the problem that skirts have nothing to do with heads (whereas the meaning of headcoverings clearly connects the metaphorical headship with literal heads), and don’t actually cover anything. If Paul meant “the women should dress like women,” he surely could have said so, and then in cultures that practiced headcovering, there would be headcovering, and in cultures that wore skirts, there would be skirts. But he made a very explicit argument based on headship, and cemented his argument by saying that women already have one sort of covering on their heads—long hair. Further, Paul’s arguments have not a word about culture: he bases it on tradition, Creation, the angels, and nature. None of which have changed. In other words, every single thing in the passage points to it being culturally transcendent. Further, while evidence is unsure, it seems the practice of Corinth was not to cover their heads. Paul was teaching something contrary to Corinthian culture. OBJECTION: It’s only mentioned in this one passage. I really don’t understand this objection, but it’s common. What difference does it make? It’s fifteen verses of clarity. Maybe the Corinthian church was the only one sufficiently un-Jewish to have not already had and known the tradition. Or whose native culture didn’t practice headcovering. Or maybe by the time the other letters were written (only 1-2 Thessalonians were earlier), word had gotten around. Who knows? This isn’t one vague verse to build a doctrine on; it’s a entire coherent argument with multiple supporting points. Objection: It’s not clear what “covering” means. More precisely, the difficulty is that “covered” seems to possibly mean completely covered, like a burqa, which then would contradict Paul’s prohibition on “e.g. braided hair,” which implies that hair was visible. I think it is sensible to admit that there is legitimate confusion here, as on the “women prophesy in church?” question. But the confusion doesn’t infringe on the question of whether or not “head covering” is necessary, only what it should look like. if covering the hair was what Paul had in mind (for modesty’s sake), then it would not make sense to call uncovered long hair a “covering” as in verse 15. Thus, it seems most sensible to me to view this passage chiefly as saying women need to have “authority” on their heads, as symbolism, not modesty. Moreover, the word argument is a poor one: the word is used frequently in the Septuagint and seems to be used just as “covering,” even if the etymology would seem to indicate something severe. (And it never refers, incidentally, to hair). This is a detailed overview, although I don’t know the veracity of the source. 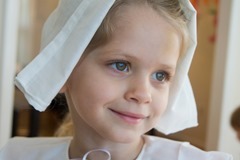 Finally, while it has no impact on the text, it’s worth noting that headcovering has been the universal practice of the Christian church from the beginning until the 20th century, and continues today in many countries and many denominations and even other religions (Mennonite, Amish, Brethren, Catholic, Orthodox, Judaism, Islam, Hinduism, etc.). The historical practice makes it hard to sort out what commentators “would have” thought in a different cultural setting, but there’s no doubt that they held headcoverings were exactly what the passage is teaching, as this blog post ably shows.